What's the point of all this business effort? Sales & Marketing for Professional Services & Strategic IssuesHow to create a Value Proposition that works! Quick Tips Videos & Sales & Marketing for Professional Services & Sales TipsHow to get going with video marketing! Everyone is busy being busy, but what is the point of it all? 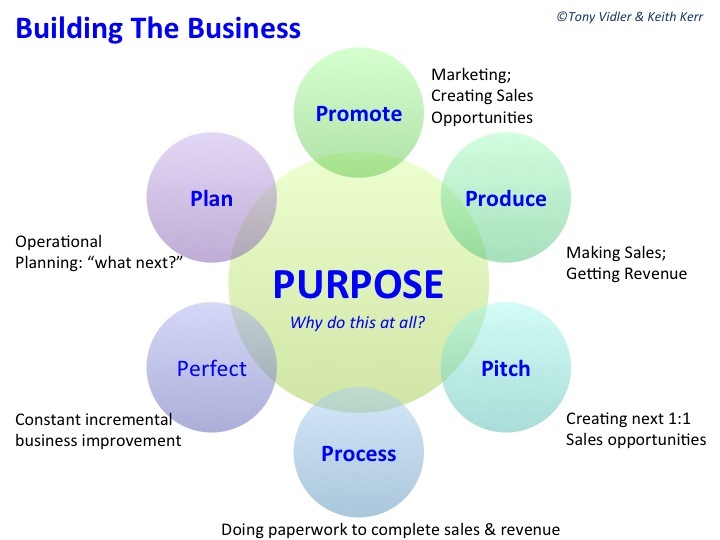 What is the purpose that drives all the business building activity? Businesses that experience superb growth typically have an owner, or owners, who have clarity of purpose and that purpose sits at the heart of everything they do. I have written before about the 6P’s of Peak Performance as being that systematic approach to doing the key elements of building a successful business and evening out the revenue or production performance (see The 6 P’s of Sustained peak Performance ), however during a recent workshop the question arose as to where these actions fitted with Purpose. An excellent adviser and friend, Keith Kerr, was present and he hit the nail on the head when he said “Purpose sits in the middle of the process and the Purpose guides the decisions in each area”. It is akin to “vision” or understanding what the end game is for your business…what you are trying to achieve. But Purpose brings in another dimension beyond having clear vision of what the business aims to achieve. Having clarity of purpose brings in the personal dimension: what is actually important to you? Does your business activity reflect, or sit comfortably, with your own values and personal goals? Will it help you achieve your personal goals and lifestyle objectives? Identifying that clear purpose for you personally will help shape the systematic approach to building a business that gives you what you are aiming for as it will help guide decisions and actions in such a way that they feel right as well as energise. Once you can identify what the point of all this business building activity is, then getting out and promoting, producing, pitching, processing, perfecting and planning becomes substantially easier – and worthwhile.